Back in school, I was a “just in time” kind of guy. My homework is a lot more fun now. When it comes to deadlines however, I still dance in the dragon’s jaw. I finished this one moments ago. This is beautiful!!! I love the colors. Looks like one of those days where the sun just feels a bit warmer making you think spring is that much closer. Love this painting! Oh my, this is so beautiful! This reminds me of our trips to Vermont each year when we went skiing! Miss Vermont so much, this helps ease that! LOVELY, LOOKS LIKE THE PROPERTY IN BACK OF MY HOME…CAN ALMOST SMELL THE FRESH AIR! Not too late for me! Another beauty – you know how much I love your winter landscapes. This one has an intimate feeling. I will be ordering some cards soon! Beautiful. Sadly I don’t find anything quite so lovely here in Florida. This is alive and beautiful. The colors are crisp, like the air. Yes, spring is coming. Thanks for sharing! If I were to choose one element that tells the story in this painting, it would be the river. 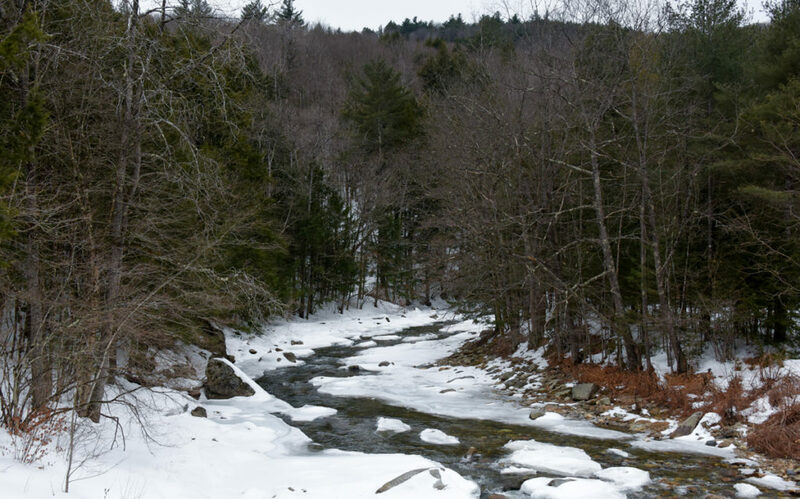 While it flows freely, you can tell by its color that winter isn’t over yet. The subtle shades of blue and green speak of cold and ice. But the warmer colors of tree trunks and grasses speak of warmer days to come and the smell of maple sap boiling in the sugar woods. A wonderful way to start the day with your brush strokes evoking joy on the canvas Peter. Truly stunning! And THANK YOU, Peter for sending “Winter Sunset”….as well as the lovely card, “maple sugaring”….Your work is just stunning…your style SO unique….and fully captures the essence of any chosen subject. Something about your paintings make me feel peaceful and hopeful in these chaotic times. Thank you for reminding us of the beauty. Beautiful work!!! Does painting go to highest bidder? How do you make bid??? Correct Louise, high bidder gets original painting. You can bid by clicking the little green “Bid” button above, in bottom right corner of painting. From there it will guide you through process. Just holler if you have questions. peter@peterhuntoon.com or 802-235-2328. Tx! 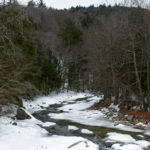 Though we escape the snow for 3 months I love to look at it from a warm house and hearing a bubbling brook or stream is the greatest! Love this painting it’s so peaceful !!! Winter scenes are often monochromatic, but this one is so colorful! The gorgeous blues and greens make this scene come alive, and I can almost hear the water and smell the cold winter air. Once again, you’ve captured with sensory detail a beautiful piece of Vermont! I love how you take such a cold looking landscape and add warmth to it. Lovely! Yes Steve, that’s where that came from. I’m a big BC fan. 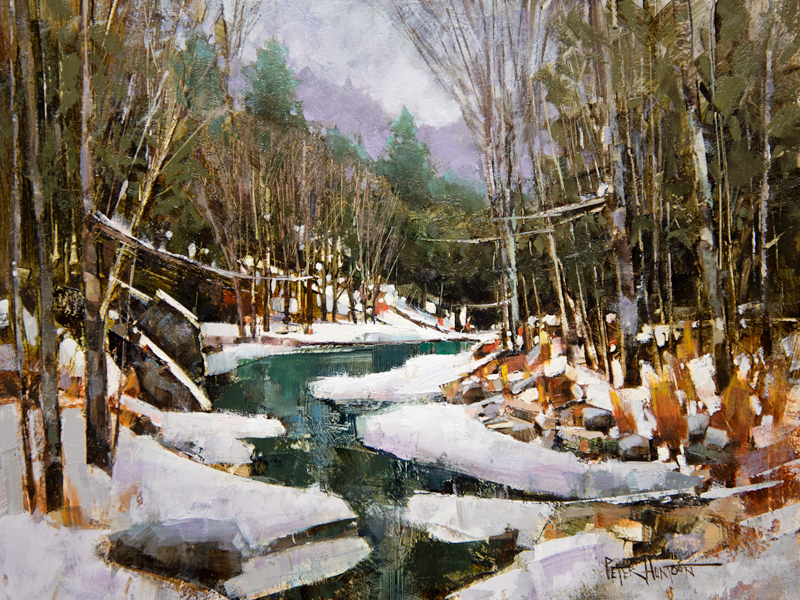 Reminds me of a favorite stream in winter while growing up in Vermont…your work is lovely and stirs my memories. 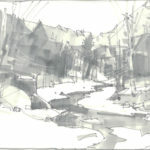 Again, I love your color choices and economy of primaries in Winter River. Just a dab will do it. Just looking at your painting, I can hear the water as it is flowing! I just need to have my name drawn?! 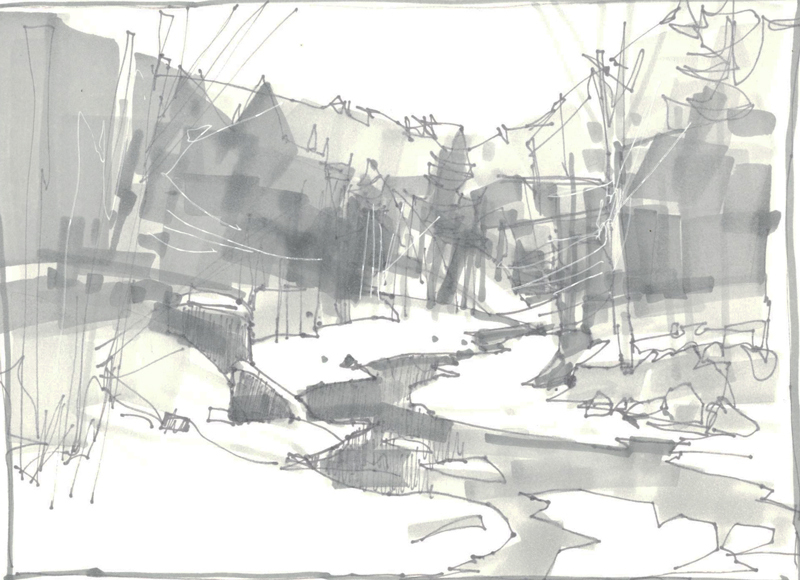 I have been imagining how the river began, etching out it’s route so many years/centuries ago…leaving some boulders intact. Wonderful painting that keeps the scene alive. Thank you all very much for all the wonderful comments! Although I always read every one, I do hope it’s OK that I don’t thank each of you individually every week. I do promise to use my time wisely at the easel for you! It’s OK!!!!! I’ve often wondered how you find enough hours in a week to do all you do! I appreciate that you post the photographs of the scenes you paint, and amazed at your talent for making VT winter scenes even more beautiful in your paintings than they are in real life!